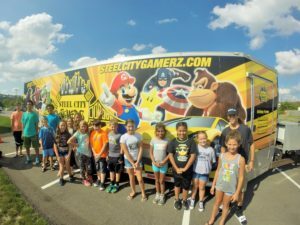 game bus | Pittsburgh's Best Mobile Video Game Truck & Laser Tag Birthday Party Place in Pennsylvania! Allegheny County and MORE! Robinson’s Autumn Festival brings folks from far and wide, young and old, to experience its once a year tradition. The Burkett Sports & Recreation Complex and the Daniel Tallon Memorial Field come alive with music, games, food, friends and fun! Each year more people are visiting the Autumn Festival and each year more vendors are taking part in this wonderful community event. We’re looking forward to having you attend this wonderful annual family event here in Robinson Township. 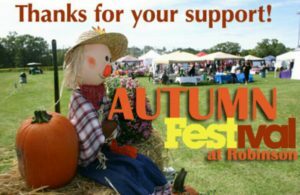 Make plans to attend the 15th Annual Autumn Festival in Robinson Township, scheduled for Saturday, September 9, 2017. The Robinson Parks & Rec Board are working on bringing back your old favorites and inviting new ones to make it the biggest and best Autumn Festival to date! The Robinson Autumn Festival is growing every year. We are currently accepting vendor applications for the 2017 Festival. Corporations can also support the Robinson Autumn Festival by becoming Corporate Sponsors. A list of 2016’s corporate sponsors can be found below. If you live, work, or play in Robinson Township, you should take part in Robinson’s Autumn Festival. It’s a great way to network with other businesses and organizations, meet the people who support you, and have fun! So be there from start to finish at the Autumn Festival. There’s food, entertainment, attractions, information, and fun for the whole family! Check out the links below to learn details of the vendors, entertainment and attractions the Robinson Autumn Festival has to offer! Vendor applications for 2017 are here! NEW SUMMER BIRTHDAY PARTY IDEA IN PITTSBURGH! 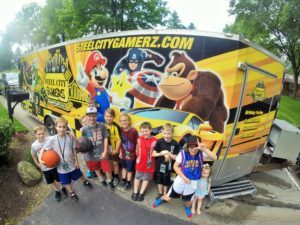 Are you looking for a new summer birthday party idea in Pittsburgh for your son or daughter? Throw a party your child will never forget! 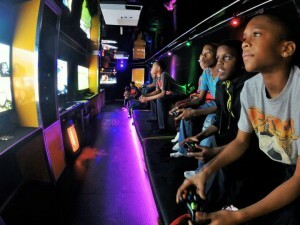 Our Mobile Game Truck can accommodate up to 20 players at once! We have over 100 video game titles including Mario Kart 8, Super Smash Bros, Call of Duty, Rocket League, the latest Sports Games, Racing Games and more! 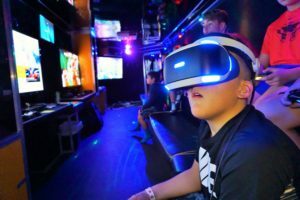 Do you feel our Mobile Game Truck may be a good fit for your next Fair or Festival? Please use the contact information listed below. “Great party!!! Great customer service. My son and his friends had such a great time. 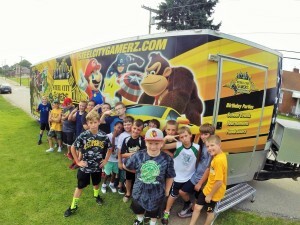 I highly recommend Steel City Gamerz for your next party! !” Melissa F.
For those of us who have a small business social media is a great way to share our business. Below are links that will enable you to connect with us. If you care to receive discounts, know what events we will be participating in and want to make a connection with us on LinkedIn feel free to click on any of the hyperlinks below. Follow and like any of our social media sites! We take pride in providing you exceptional service from start to finish! There is nothing more important to us then having satisfied customers. We treat each party as if it was our first!! Thanks and looking forward to hosting your next event!